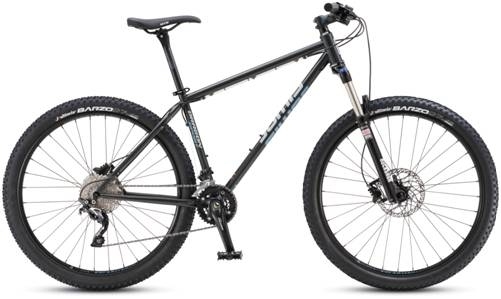 Our best selling mountain bike comes from the Jamis Dragon series. The Dragon Sport is our No.1 selling mountain bike. The Dragon Sport is the most inexpensive model in the Jamis Dragon family, and it is offered as a 29er or as a 650B. The Dragon Sport strikes that perfect balance between price and quality, which is undoubtedly why it has been our best selling mountain bike. At only $1300, the Dragon Sport is the perfect bike for the budget-conscious mountain biker who wants to ride hard and fast. First off, there's the Reynolds 520 double-butted chromoly frame that comes with a Lifetime Guarantee from Jamis. Then, there's a 100-120mm suspension fork with an air spring, be it an X-Fusion or Rock Shox, depending on the model year. Next, you'll be very satisfied with the performance of the Shimano Deore-level 2x10 drivetrain, and the Shimano hydraulic disc brakes. Shimano's new Deore 10spd group is turning a lot of heads these past few years as it has been getting high praise from a lot of different publications. The Dragon Sport's cockpit is usually spec'd with Ritchey components, making it trail-worthy right from the start. The Dragon Sport has been our best selling mountain bike for a few years now, but its not the only Dragon available from Jamis. The Dragon has a long and glorious history with Jamis Bicycles. The Dragon was first hatched back in 1993. Back then, the frame was constructed with Tange Prestige steel tubing, which was fillet welded, then plated, and then hand polished. It made for one beautiful, nice-looking bike! Later, In 1997, the Dragon was offered in the world-renowned Reynolds 853 tubing, making it one of the very first USA production bicycles to feature the legendary 853 tubesets. Today, the Dragon series is continuing that tradition, offering a strong, durable, lightweight mountain bike that has an unbelievably smooth ride. If you take a look below, you can see the 2016 Dragon lineup. It includes the Dragon Sport, 29 or 650B, and the Dragon Pro 650, the all-new Dragonslayer 650 Plus, and the also all-new Dragonfly 650B female specific mountain bike. The Dragon Pro is the upgraded version of the Dragon Sport. Instead of a Reynolds 520 chromoly frame, the Dragon Pro is has the Reynolds 853 air hardened, heat treated chromoly frame, which is lighter than Reynolds 520, and every bit as strong. Some people would say that the 853 frame has a nicer ride quality than Reynolds 520, too, but that's more a matter of opinion. 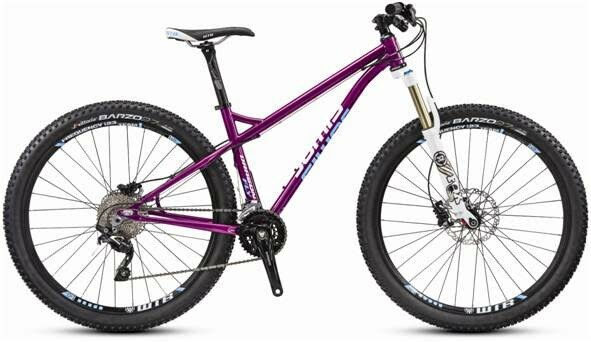 In addition to the more expensive tubing, the Pro model frame has some other nice upgraded features, such as: am over-sized 31.6 seat tube, a 44mm head tube for running forks with tapered steerer tubes, and sliding rear dropouts (for single-speed conversions) with 12x142 thru-axle. Big upgrades there! The Dragon Pro is also going to have a nicer, more expensive component spec. The Pro also comes stock with a dropper post. Nice! Then, we have the Dragonslayer! My new favorite bike from Jamis Bikes is the Dragonslayer. The Dragonslayer has 650B wheels, BUT instead of a regular width tire, the 'Slayer has 45mm wide rims and 3" wide tires. The increase in tire volume improves traction and float. The Dragonslayer is definitely one of the hot new bikes for 2016, and it has been getting rave reviews from every publication that has tested it. Check out our blog post on the Dragonslayer! 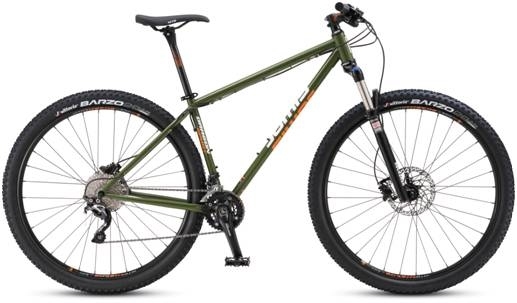 The Jamis Dragons are awesome mountain bikes, there's no doubt about it. But, they're not the only amazing, hella-cool, mountain bikes Jamis has to offer. Check out the Jamis website, Mountain Bikes, and take a look at the other hardtails, and the full suspension bikes Jamis has to offer. Come by our shop and test ride a Dragon today!